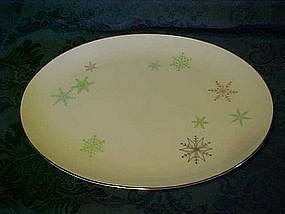 Nice oval serving platter in the snowflake pattern by Harmony House China measures 12 1/8" long. Pretyy delicate snowflakes of green gold and silver. Perfect condition, no visible wear.